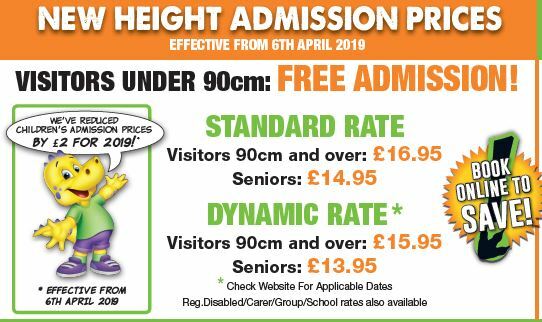 Effective from 6th April 2019, we will be introducing our BRAND NEW height admission prices at ROARR! Dinosaur Adventure. This includes a reduction, for 2019, on children’s admission prices by £2 – off the 2018 price. Our Standard rate pricing covers holiday and weekend days from 6th April through to 27th October. Predator High Ropes will be open on each of these days, included in your admission price! Dippy’s Splash Zone will be open daily from 6th April through to 29th September. Young Explorers 90cm and over can enjoy everything that our park has to offer – although our safety guidelines are set at 100cm (accompanied by an adult) and 120cm (alone) for Predator High Ropes. Children under 100cm are required to be accompanied by an adult on Stone Age Road Race. Our Dynamic Rate is in operation weekdays (outside of the school holidays) between 6th April and 29th September. We’ve reduced children’s admission price by £2 during standard rates on 2018 – meaning these days provide fabulous value for money during 2019 Standard Rate periods. Our Winter 2019 Rate are applicable fully from 28th October – Pre-Easter Holidays 2020. As well as weekdays, commencing 30th September and in October excluding October Half-Term. These are our lowest rates and are discounted rates on our standard rate admission. This reflects the fact that Dippy’s Splash Zone and Predator High Ropes are closed during the colder months. However, our Dinosaur Trail, Secret Animal Garden and Dinomite Indoor Play are all open during this period. Our Winter rates have also been reduced on our 2018 Winter rates. CLICK HERE to read our Q’s & A’s about our new prices and ticket options. Groups – reduced rates are available for groups of 12 or more paying guests. Reg. Disabled/Carer/Group/School rates also available. 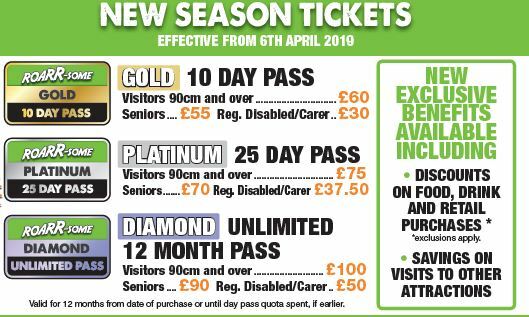 We are delighted to announce that we have three new Season Ticket packages for you to choose from, effective from 6th April 2019. Exclusive benefits available, including an increase on discounts in our food and beverage outlets and retail shop – for full details CLICK HERE. Season tickets are valid for 12 months from purchase date, or until day pass quota spent, if earlier. Named person, not transferable. Photo required. A valid season ticket MUST be shown when visiting ROARR! Dinosaur Adventure or admission will be charged, which is non-refundable. For current season ticket holders – your existing season ticket will still be valid until your renewal is due. Upon renewal, you can then choose from one of the three options above – and enjoy all of our new benefits and top attractions. You will also SAVE A FURTHER £10 when you renew! Full terms and conditions to be confirmed in due course.